The crowd came out in droves to watch the first sanctioned bare knuckle boxing match. Even the upper levels of the venue were packed and many found fans opted to stand rather than squeeze in for a seat. Bare Knuckle Boxing took place in a 22-foot diameter circle ring with four ropes. Like traditional boxing, punches were the only strikes allowed. One of the big differences is that fighters were also allowed to punch in the clinch, which could include grabbing the back of the neck or head and “dirty boxing.” Another variance was the “toe line.” Boxers start each round standing at the toe line in the middle of the ring, just inches from each other rather than in their corner. The fighters were not allowed to wrap their hands within one-inch of the knuckle but are allowed to wrap the thumb and wrist for support. 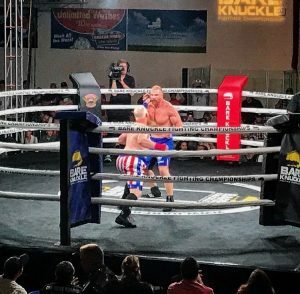 The Bare Knuckle Fighting Championship event marks the first bare knuckle boxing competition since 1889. All fights were scheduled for five rounds, each lasting two minutes though few made it that long. Of the eight heavyweights competing, four made it on to the quarter-finals of the heavyweight tournament in September. The finals are scheduled for December, with the winner recieving $50,000 just in time for Christmas. There was going to be no middle ground for this inaugural event. It was either going to be a huge success or a complete disaster. With an organized format, experienced key players on the sidelines, a house full of fans on their feet and PPV that was actually being purchased, it seems like the show went over impressively well. Unlike traditional boxing or MMA, lack of gloves appeared to reduce the amount of repeated head trauma. No fights were stopped because the fighter couldn’t continue. A knockout was a knockout and a cut was a cut. Each of the fighters was back on their feet after the bout. The ringside physicians kept a watchful eye on each cut and there was no controversy on stoppages. Heavily experienced cutman Jacob “Stitch” Duran was working the event which was refereed by “Big Dan” Miragliotta. It didn’t take long for to christen the canvas with blood. The first bout ended in the second round via doctor stoppage with Arnold Adams bleeding to heavily to continue at the hands of DJ Linderman. 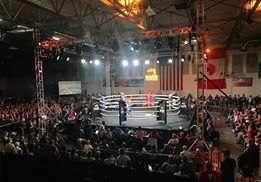 The next two fights also wasted no time with Estevan Payan dropping Omar Avelar in the very first and Dale Sopi falling to Maurice Jackson in the second round. Just when fans were beginning to think it would be a short night, Reggie Barnett and Travis Thompson put on a five round war. The bantamweights demonstrated the speed and aggression you would expect from lighter competitors. Both fighters made use of the ability to clinch, which is not typical of traditional boxing. The fighters received a standing ovation from the crowd and Barnett won the unanimous decision. The fifth matchup was another fast one with Johnny Bedford getting the TKO in round two against Nick Mamalis. Winning the award for weirdest fight of the night, Bobby Gunn made quick work of Irineu Beato Costa Jr. who, despite having a decent record (19-7-0) didn’t put on the show that was expected and was dropped twice in 41 seconds to end the fight. Sam Shewmaker wasted no time against a dangerous opponent, winning via one-punch knockout against Eric Prindle. 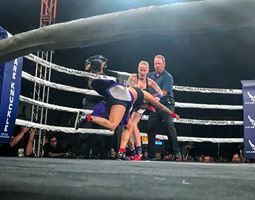 The much anticipated female match-up between Bec Rawlings and Almanza Garcia was a great display of boxing technique and clinch work. The ringside doctors called a stoppage at the end of round two due to a bad nose break that had Garcia’s blood running onto the canvas awarding Rawlings a second-round TKO. The fight that had fans on their feet was the heavyweight matchup between MMA veterans Joey Beltran and Tony Lopez. Beltran won the first few rounds with technical striking as he bloodied the face of Lopez, who was dropped in the first but refused to stay down. Lopez never lost that perseverance and the two put on a brutal display of dirty boxing lasting all five rounds without slowing down. Not only is that a difficult feat, it is also unusual for two heavyweights to maintain that kind of pace. Though Beltran won the decision, the fans won that fight. The main event was a showdown between former UFC heavyweight champion Ricco Rodriguez and Lewis Rumsey. Unfortunately, following the amazing performance of Beltran and Lopez, this bout was held to a higher expectation. Though the boxers were engaging, their clinches were more typically for what is expected of heavyweights, especially in the later rounds. Rodriguez won the bout via unanimous decision.